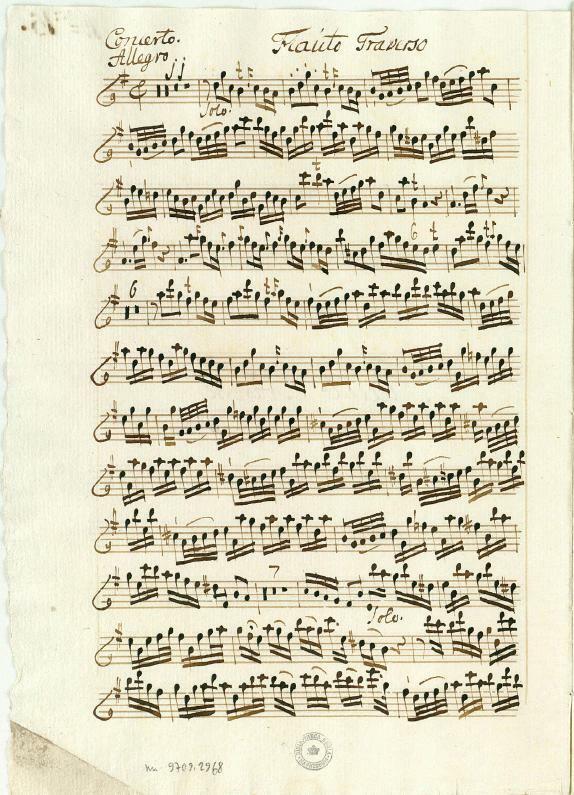 Picture of Quantz concerto QV 5: 177 used with the kind permission of the Sing-Akademie zu Berlin. Quantz composed about 300 flute concertos, more than 40 trio sonatas, nearly 200 solo sonatas, flute solos, duets and trios as well as some vocal music. His work mirrors the transition from late Baroque to early Classicism. Most of his trio sonatas and the early solo sonatas have four movements, following in their slow-fast-slow-fast order the Sonata da chiesa. Quantz’s preference for the mixed style manifests itself in the use of French elements such as French dances besides the Italian elements. In most of his solo sonatas the movements are in slow-fast-fast sequence, and the bigger part of his concertos has three movements with fast-slow-fast order modeled on Vivaldi’s music. Whereas Quantz still set up the formal order of his early concertos quite exactly to those of Vivaldi, he expanded the form of this in his later concertos. 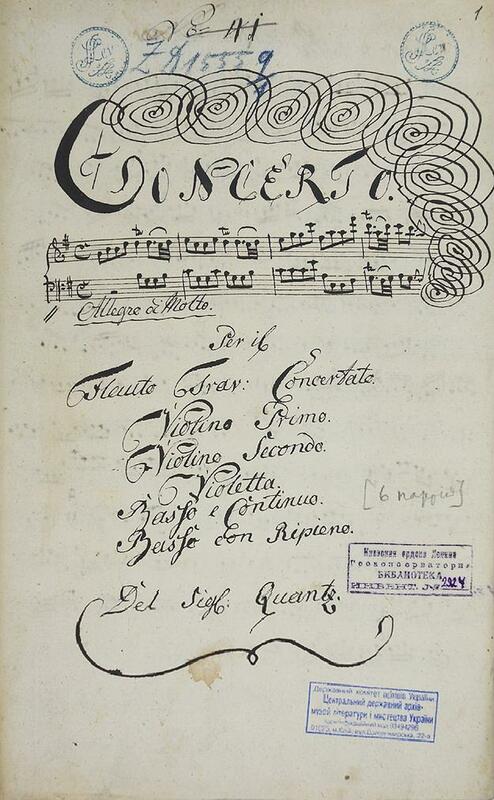 In the first movement he favored a five-ritornello, four-solo format. He preferred common time for the opening movement, but a lighter meter for the closing one. His slow movements usually provided either modal or tonal contrast. Concertos in the major mode most commenly resorted to the subdominant for the middle movement, or to the tonic minor. See: Meike ten Brink: Die Flötenkonzerte von Johann Joachim Quantz. Untersuchungen zu ihrer Überlieferung und Form.